Differences between eBook media formats are blurring. Due to a convergence of technologies around HTML5, books can be published through eReader devices, as mobile applications, or on the web. 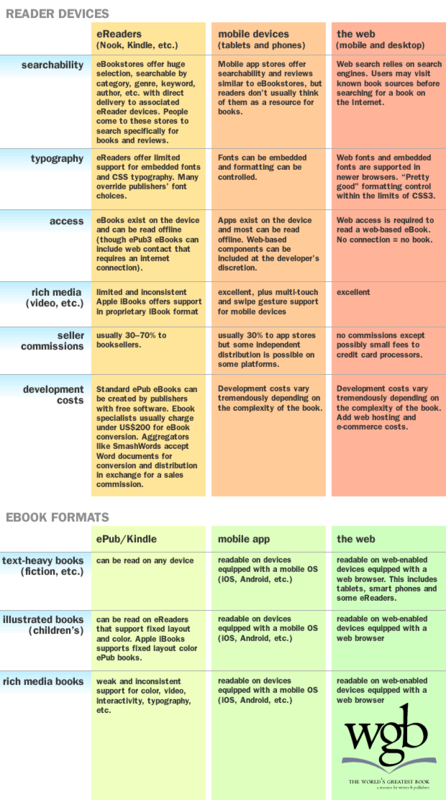 This article examines the pros and cons of each eBook format. EBooks are based on HTML, the same technological foundation that powers the worldwide web. As the web has grown, so have eBook technologies—at least in potential. The ePub3 standard, released in October 2011 and continuing to develop under the auspices of the International Digital Publishing Foundation (IDPF), describes an eBook as a “website in a book.” Growing concurrently with the Internet are mobile operating systems and app stores (like Apple’s iPhone OS and Google’s Android), and eReader devices (like Barnes and Noble’s Nook and Amazon’s Kindle). If popular mobile devices can render eBook content, web content or mobile applications, which of these media is best suited to the needs of publishers? For years, eBooks (in mostly ePub2 format) stood apart from the web and mobile apps in a closed universe; the reader found a book in an online bookstore and downloaded it to an eReader device. Dedicated eReader devices were once exclusively designed to facilitate finding, purchasing and reading books, but the differences between eReaders and tablet computers are rapidly disappearing. Recent offerings come with color screens, wireless web browsers, and mobile operating systems. These eReader devices are no longer walled off from alternate eBook distribution formats like apps and the web. EPub eBooks come with limitations; dedicated eReaders simply lack the power to deliver the engaging experiences associated with mobile apps and the web. Currently, no eReader device supports the full ePub3 specification. Worse, different eReaders support different features. Support for audio, video, interactivity and other media is inconsistent if available at all. Until eReader devices empower publishers to deliver elegant typography and rich media, eBooks will remain functional but simple—a “good enough” solution where typographic aesthetics and non-text content are of secondary concern. Apple introduced the iPhone OS and Apple App Store in 2007. The iOS world is engaging and seductive, offering innovative hardware and a tactile user experience. Apple’s iBooks eReader app is based mostly on ePub2 technology, but it does support part of the ePub3 standard. Apple’s free iBooks Author software provides mac-based publishers with an intuitive user interface and powerful tools for creating rich media, fixed layout interactive books, but these books can only be exported to a proprietary iBooks format and they can only be read on iOS devices. As eReaders go, Apple’s eReader app deserves credit for delivering the best user experience; eBooks are rendered with flipping pages, paper texture and typography that, if not ideal, is a cut above the competition. In 2007, Google introduced its Android mobile operating system. Unlike Apple’s iPhone OS, Android was released as open-source software. In other words, anyone can develop a mobile device or an app that runs Android without having to pay royalties or submit to an approval process. Android had a 59% market share at the beginning of 2012, and it remains the most popular mobile platform. The Android App store offers numerous eReader apps capable of rendering ePub, Kindle and other eBook formats. Other Mobile Operating Systems such as Palm OS, Symbian, and Windows Mobile account for smaller but significant shares of the mobile marketplace. Most offer ePub2 eReader apps. Today, technology like Adobe PhoneGap empowers web content developed with HTML5 to be packaged into an app for most any mobile platform. This simplifies development and offers access to popular, searchable retail spaces where customers post ratings and reviews. Downsides are (typically 30%) sales commissions, the requirement to obtain vendor approval from some stores (which some argue amounts to censorship) and lack of popular awareness that app stores can be a resource for books. For years, the web was the only “visual” content delivery channel (standing apart from text-based newsgroups and email lists that could be consumed without a web browser). In spite of early attempts to introduce proprietary technologies, the web remains free and open; anyone can publish or distribute anything, free of middlemen and corporate approval processes. The majority of mobile phones, tablets and eReaders, including Apple’s iOS tablets and phones, are equipped with a webkit browser. Webkit is an open-source browser “engine” started by Apple. Apple opened an unexpected door when they refused to allow Adobe Flash content to be displayed on iOS devices, insisting on “web-standards-based” technologies. Since then, Adobe has contributed key components of its Flash Player code to the webkit codebase and HTML5. (HTML5 actually refers to a collection of related technologies that include HTML, CSS, jQuery and other technologies. If that sounds techy, don’t worry; you won’t need to learn any new skills unless you’re a developer.) In its current, advanced form, webkit makes the mobile web browser a viable platform for distributing eBook content. Of course, desktop PCs are also equipped with web browsers (Chrome and Safari are webkit-based), making the web a potential one-size-fits all delivery channel for books. And because HTML5 is a developing standard, non-webkit browsers are likewise implementing the new codebase. Choosing Platforms: EBooks, Apps and the Web. An understanding of eBook design considerations offers guidance to publishers choosing eBook formats. Portability is a fundamental principle of eBook design. Though desktop reader software is available, most people prefer to read eBooks on lightweight mobile devices. Tablet devices, smart phones, and an increasing number of dedicated eReaders are web-enabled with color displays; any of these devices can display apps, ePub or web-base books. Virtually any mobile device is a target for publishers. Dedicated, non-web-enabled eReaders that display only ePub books represent a shrinking market segment. Responsive Layout: Developers once had to create separate versions of content to suit different screen sizes and orientations, but HTML5 is changing that. New standards allow for responsive layouts—pages that change in size and format to suit the dimensions of the screens they’re being displayed on. Content can display one way (for example: as two columns) on a desktop or landscape-oriented tablet, and another way on a mobile phone or portrait-oriented tablet. Whereas apps are often designed to fit particular screen sizes, and ePub files are “flowed” into whatever device is presenting them, responsive layout gives the web one advantage. One-size-fits-all formatting allows your book to look great on any device with an up-to-date web browser. EReader Screens: Many consumers are happy with “basic,” affordable eReader technology. Though screens are black and white, and books are rendered in a rather uninspiring typographical format, eInk displays (designed to be read in natural light) are comfortable to read and they offer long battery life. Most of these eReader devices are not equipped with a web browser, but they fulfill their practical purpose (reading a book) quite well. At the time of this writing, four of eight devices in Amazon’s Kindle family do not offer web access. Two of four Nook offerings are similarly configured. For the time being, users of eInk devices will not be able to consume web-based or app-based eBooks on their devices, though some of these readers own separate mobile phones or tablet computers. Unknown is what course eBook hardware evolution will take. EReaders (like Amazon’s Kindle Fire) will continue to compete with generalized tablet devices like Apple’s iPad. We’ll see more web-enabled eReader devices, but what about readers who prefer eInk screens? Color eInk displays are on the way. EReaders equipped with such a screen might offer the long battery life, diminished eyestrain, and low price preferred by owners of current “low end” devices, but color eReaders won’t necessarily be web-enabled if that omission keeps their prices competitive. EReaders still represent the “traditional path.” To reach the maximum number of eBook consumers, design your content to display well on simple, black and white screens and live within the limitations of ePub2. Content Rendering Options: Thanks to HTML5, mobile web browsers can display embedded fonts, elegant typography, audio, video, interactivity and imagery on any device and any platform—a great deal more than any eReader app is currently able to display. If presentation, elegant typography and embedded media are principle concerns, web-based and app-based eBooks will provide a higher-level experience than ePub. Searchability: EBookstores are the “go to” place for readers who want to find books, read reviews, and participate in eBook lending programs. Web-based EBooks will not appear in these hugely popular “eBook search engines.” App stores are likewise searchable—and like online bookstores, they offer places where buyers can post reviews—but they’re not popularly thought of as places to search for books. If you have the ability to market your book independently, consider apps and the web as distribution channels. If you want ultimate searchability, distribute your eBook through major online bookstores, pay the seller commissions, and live with the limitations of ePub eBooks. Live Access: EPub eBooks are stored in the device they are consumed on. A live Internet connection is only required when a book is being transferred to the eReader device. This will change somewhat when the ePub3 specification is implemented as embedding live content (e.g. Google Maps) is possible, but eBooks are considered to be self-contained; you can take your eReader on a plane or cruise ship and not lose access to your library. Mobile apps can access live content at the discretion of the developer. Web-based eBooks require a live Internet connection. Consider web accessibility when choosing your delivery platform. The ePub3 standard promises to bring eBooks into functional parity with web-based content but until device manufacturers support and implement the new standard (and publishers develop compelling content that makes it worthwhile for readers to update their hardware), we’ll likely see most “rich” eBook content developed with proprietary technology like Apple’s iBooks Author software. Display technology will also have an impact. Will color eInk offer a viable alternative to gorgeous LED technology like Apple’s retina display? Will all eReaders ultimately become web-enabled? Tools for authors, designers and developers that make it easy to develop standards-based (ePub3) rich eBooks are slow to arrive. When new eBook software does become available, will writers find design guidance or turn new eBooks into a cacophony of “click-to-make-the-cow-moo” children’s books and “textless” textbooks for students who don’t like to read? “Rich” eBooks are the tiniest tip of the publishing iceberg. Millions of books have been published in the traditional “text with images” format, and readers have been satisfied with these books for centuries. Though popular mythology holds that “nobody reads anymore,” publishers know otherwise—they sell huge quantities of books to readers who love the printed word. Many of these readers are yet to be enticed away from paper books by eReader devices, and they won’t be until they see powerful content that persuades them to jump ship. At this time, publishers have neither the tools nor the design guidance—and they certainly haven’t had the time—to develop a large library of eBook offerings that show off the potential of eBooks. Until publishers create books that sell readers on the merits of enhanced reading experiences, device manufacturers and eBookstores will have no reason to hurry. Web, eReader or App: How best to distribute your work? Much depends on your writing goals, genre and business expectations. If you’re a fiction writer or memoirist, you may do well to simplify your life, reduce your development costs, and release your book in standard ePub2 format. Though your formatting options are limited, your text will be readable, searchable, reviewable and accessible. At least Apple’s iBook reader will render your simple ePub file in a way that borders on elegant. Develop on your own with open-source tools like Sigil, or consider using a service like Smashwords to convert your manuscript from Microsoft Word and distribute it. If you’re a documentarian or educator and your work will be enhanced by photography, videography and other “rich” content, consider the merits of web or app-based eBooks. Apple’s iBookstore offers a middle ground; it allows easy development (as long as you’re on a Mac) of rich eBook experiences (with the caveat that any outside web or app-oriented HTML development will not be portable into the iBooks software). Publishers of illustrated children’s books can make use of some devices’ limited ePub3 capabilities—as long as their books aren’t wildly interactive—but eReader support for fixed layout books remains inconsistent. For these books, the web, apps, and Apple iBooks will deliver the most engaging reader experiences, but (depending on the complexity of the book) Amazon Kindle’s KF8 format may also deliver the desired experience. Nonfiction writers have varying requirements. Text-heavy books are better suited for ePub display. Add diagrams, sidebars and other supporting media and you’ll have to consider other formats. The distribution chain/point of sale is an important consideration. If you have ready access to your audience, you may not need the searchability delivered by eBookstores. Not having to pay commissions charged by bookstores and app-stores is a compelling proposition, but few publishers are able to bypass the world’s largest eBook distributors and market their work successfully on their own. Without bookstores, promotion, development costs and establishing e-commerce payment gateways become the publisher’s job. 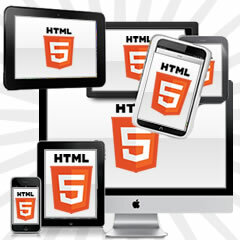 HTML5 is the technological thread that increasingly ties eBooks, web-based experiences and apps together. As media converge around common technology and publisher-centric development tools, the distinctions between them will become more ambiguous. Mobile web browsers can currently display book content better than eReaders; the web offers freedom of expression, unrestricted commerce and design flexibility. App stores may turn into second stream bookstores as publishing innovators look for ways to bypass the limitations of eReaders. I’ve just published an ebook with ePub3 and yes, it is unfortunate that only iBookstore adopts this format for now. Hopefully the rest of the stores can catch up soon. ePub3 changes the way stories are told but I don’t think it is a lot cheaper to produce compared to book apps. I do worry/wonder about the fragmenting of eBooks in the future as devices break out of the ebup/mobi standards. When some devices allow more complex formatting, will eBooks be readable across all devices? Or are we headed for another standards war? Ironically, ePub3 is most beneficial to developers of eReader devices. If they allow apps and the open web to remain a superior format, people will use eBookstores like they now use physical bookstores; they’ll search for a book there and then buy the better, web-based or app version directly from the publisher. If anything, the standards war is between eBooks, apps and the free and open web. As portable devices increasingly offer all three format choices and publishing tools grow more sophisticated, readers may well choose a reading experience that big booksellers don’t own a piece of. This is a great article. The jump to HTML5 would certainly enable a much more open and standards-based way to read eBooks. I think the EPUB3 standard does a good job of utilizing HTML5 while creating a system to contain items unique to eBooks (such as the metadata). Unfortunately, adoption of EPUB3 by the big online stores has been terrible, to say the least. Thanks for this, really great points and comparisons here. The digital formats available now give the reader more choice of a format suited for them, yet does give challenges to marketers and publishers looking at creating digital editions. A number of solutions today offer publishers a variety of output options which can allow them to reach a wider audience. Understanding the reader is now more important than ever.